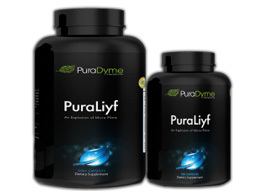 PuraLiyf Probiotics are actually enzyme enhanced LiyfBiotics! Combining all the health benefits of Probiotics with the proteolytic capabilities of enzymes, this formulation is the perfect supplement for those suffering from extreme ailments! 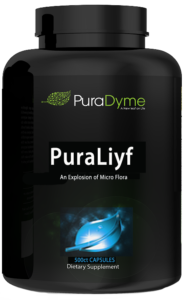 PuraLiyf is a powerful multi-strain probiotic that contributes to a natural, healthy intestinal tract using five synergetic strains of friendly bacteria! 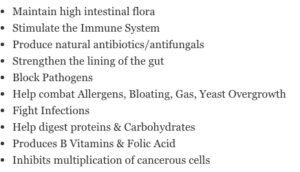 This formula is perfect to take daily to help improve digestion and restore healthy flora. It can also beneficial to use at the end of the day after flossing and teeth cleaning, to assist the body in the regeneration of the cells in the mouth, (particularly for gum disease) sore throats, bad breath, and loose teeth. Take 3 capsules twice daily with a full glass of purified water. No Toxic Fillers, No Binders, No Extenders, No Excipients, No Preservatives, No Heavy Metals, No Stimulants, No Gluten, No Soy, No Lactose, No Animal Derivatives, No Microbes or Fungi, No Chemicals or Solvents, No Harmful Substances, No Artificial Sweeteners, No Sugars.